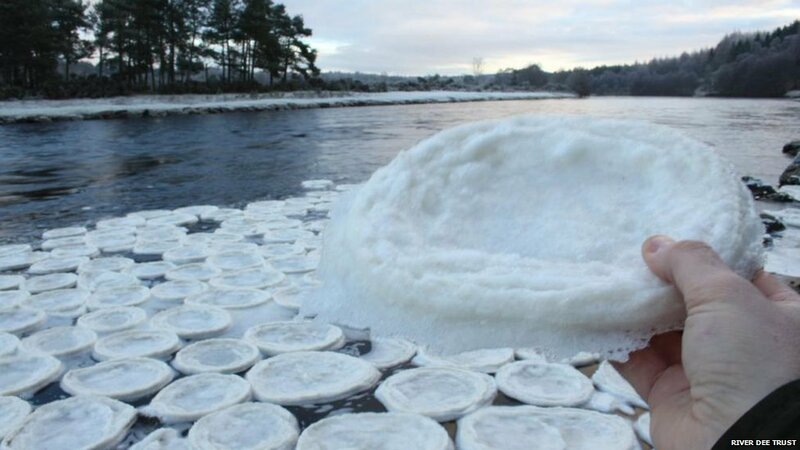 “Ice pancakes” the size of dinner plates have been found floating on the River Dee in Scotland. The strange discovery was made by members of The River Dee Trust at a place called the Lummels Pool, at Birse, in Aberdeenshire. River Dee Team biologist Jamie Urquhart said it was thought foam floating about on the water started to freeze and bump together, forming the discs. The phenomenon can be found in rivers and in the open sea. Mr Urquhart, who found and photographed the “pancakes”, said: “What we think happened is this – foam floating about on the water started to freeze, probably at night. Mr Urquhart added: “The air temperature rising – being colder at night due to the clear-sky conditions but warmer in the day – means the discs may have grown at night, collecting new foam. “Then during the day, when the discs softened in the sun, softening particularly around the edges, the collisions raised up the rims. BBC Scotland news website reader Nick Lindsay got in touch to say he had spotted the same “quite bizarre, but lovely features” on the River Brora in the Highlands five years ago.